A simple story that's simply told - Amulya Malladi's "Serving Crazy With Curry". A dear friend of mine brought me a few Indian Literary treats, as she called it, from her recent recent trip to India, and Malladi's novel was one of them. Having read a couple of her other novels, "Sound of Language" being the most recent, I was eager to read this one even though, to my disappointment, it was one of Malladi's earlier writings. "Serving Crazy With Curry" was an easy read, and I enjoyed that since I was on my first week of vacation from school. The simplicity of the reading experience is what I liked most about this novel. Though Malladi's picked on the very serious subject of suicide survivors, she gave it a delectable gustatory twist, and that removed all hues of morbidity from the ambiance in which the story unfolds. The protagonist, Devi, takes to cooking almost as a sort of rehab therapy. What drives her to suicide, and whether her unique rehab works for her is basically what the novel is about. Malladi's does not explore any profound truth in the novel, neither does she delve into thematic complexities; she focuses on her storytelling interspersed with random sampling of Indian recipes concocted by Devi, the suicide survivor. In fact, the title is quite the give away, but fortunately for the reader and Ms. Malladi, one realizes this only at the end of the novel. There are three other intriguing female characters in the story who, besides being related to Devi, have very unique life styles that add a pulsating readability to the novel; in fact, Ms. Malladi's could very easily spin another story around any one of these three women! 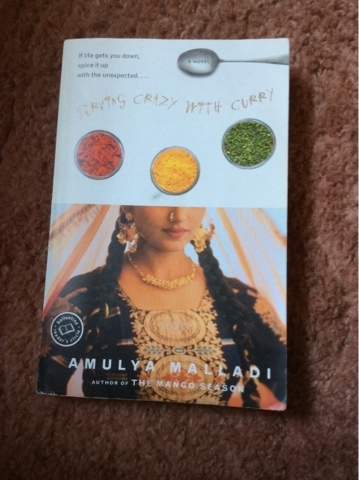 Malladi's novels have always been my favorites when I'm looking for a light read, and "Serving Crazy With Curry" fit the bill. Writing a best dissertation need a long time research on the topic. Now days students are not ready to spent more tome on research. They buy dissertation online from the online services to let their work to be complete. Chitra Banerjee Divakaruni's "Sister of my Heart"